The Shabby Stamper: I love the vintage look! 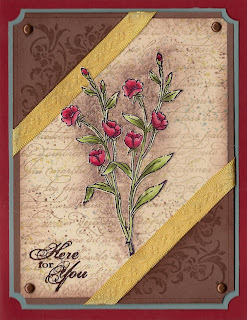 The flower image on this card was taken from Friends 24-7, which I watercolored and cut out. I love to layer background stamps, and I used En Francais in Sahara Sand and the spatter pattern from Itty Bitty Patterns in both Sahara Sand and Close to Cocoa. I sponged around the edges with Close to Cocoa, as well as behind the flower image. The corners are cut with the SU ticket-corner punch and stamped with the filigree from Friends 24-7. I drew lines with a ruler and my Close to Cocoa marker through the corner pieces to echo the Close to Cocoa layer and give it continuity.